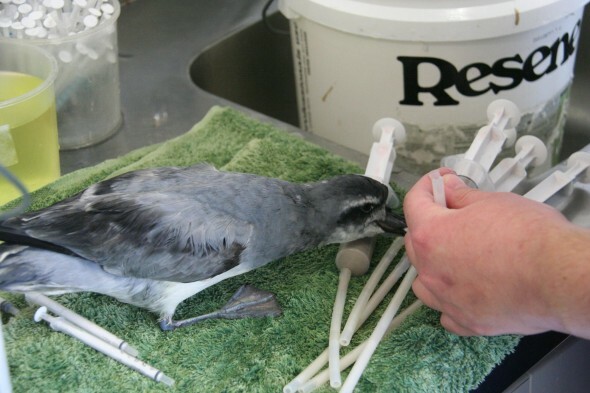 In July 2011, Wellington Zoo’s veterinary hospital The Nest Te Kōhanga was inundated with more than 650 prions after a massive storm system out at sea blew them inland. The majority of the birds were Broad-billed Prions however 20 Salvin’s, 6 Fairy, 2 Antarctic, 1 Fulmar and 1 Thin-Billed Prion were also admitted after the storm. Birds were brought to the Zoo in the hundreds which resulted in a flurry of activity to try and determine how we were going to hospitalise such a large number of patients and where we would put them all. 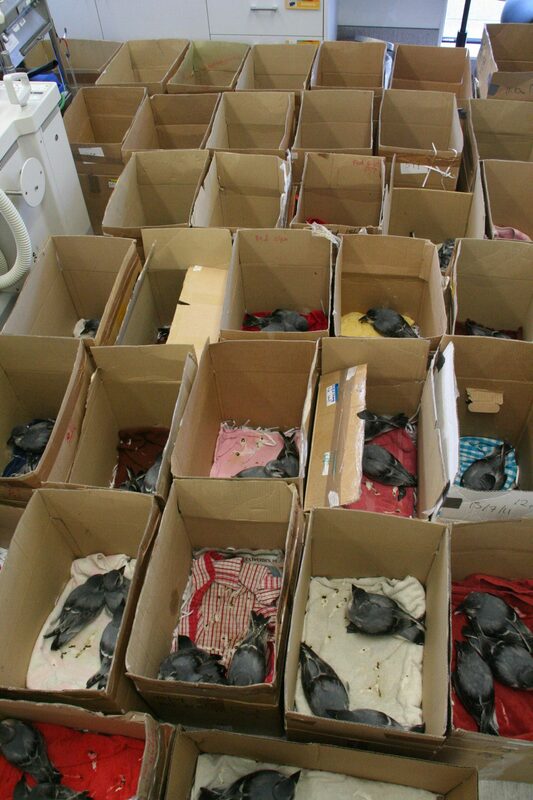 We had to utilise every available space for these birds including the Surgery Theatre and Treatment Room. The birds arrived weak and exhausted and were suffering from anaemia. Their feathers had also lost their waterproofing. 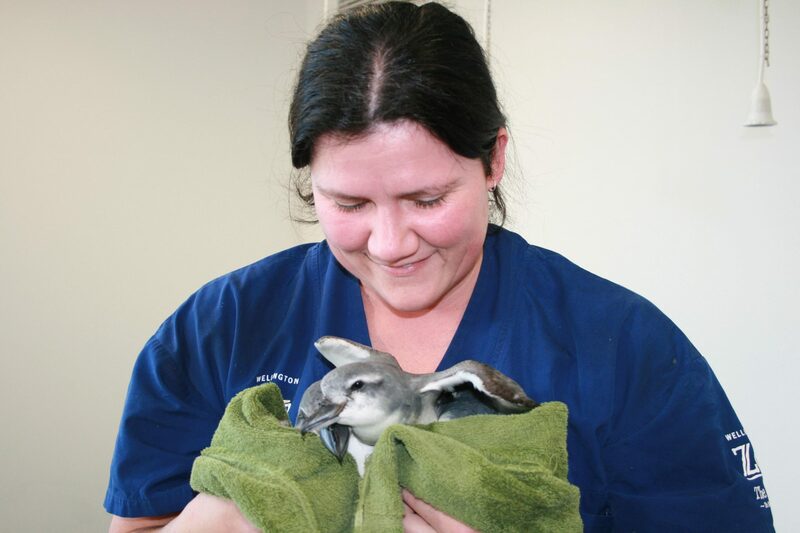 They were stabilised with fluids, food and warmth on arrival. Birds that had fractures or other severe injuries were assessed and they were euthanized as their prognosis was not good and they would not have survived treatment. Food supply was the next big issue and a dedicated team of zoo staff perfected the art of making fish slurry which we use to feed pelagic sea birds when they are hospitalised. This is pretty smelly work and involves blending salmon and sardines in an industrial blender and then passing it through a sieve. In the early days of the wreck around 20 litres of slurry were required per day. 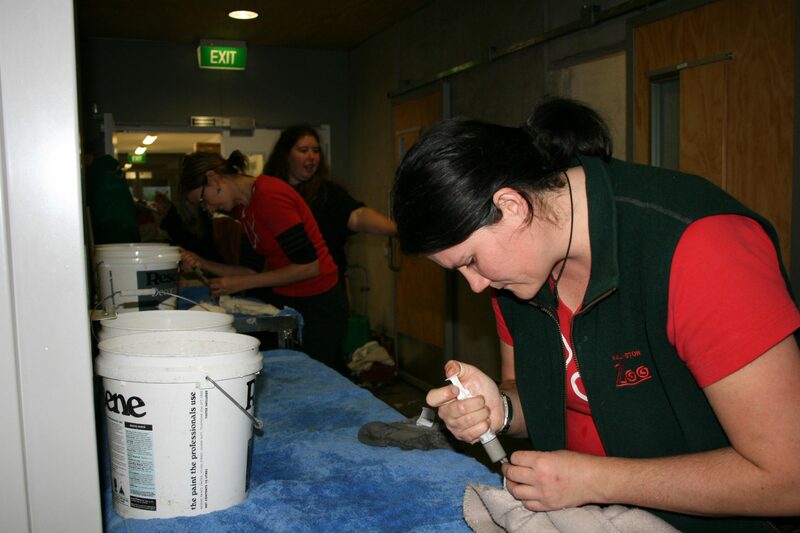 Staff from all areas of the Zoo were rostered on to help out with making the slurry. Feeding and medicating the birds was the most labour intensive part of the entire process. This involved a team of people feeding the birds through crop tubing while another team made sure there were clean boxes to place the birds back in to once they’d been fed. It was an efficient production line of feeding birds and cleaning enclosures which started at around 7:30am and finished up well into the evening, usually around 8:30pm. Prions, as a species, tend not to do well in hospital. As we had such high numbers, the mortality rate was high due to a number of factors including exhaustion and dehydration from the storm and the stress of being in new surroundings. Some of the birds developed pododermatitis due to being on land for extended periods and the most severe cases were euthanized. 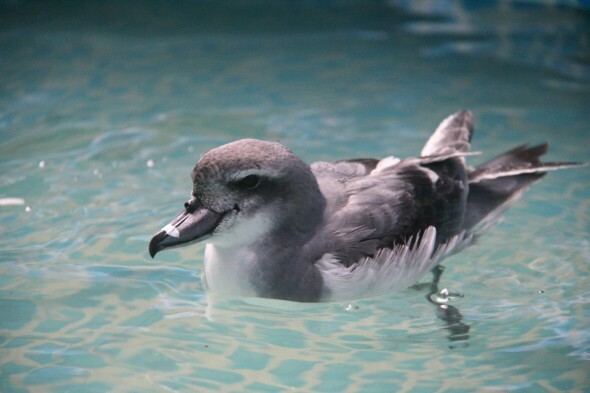 This secondary disease is common in hospitalised pelagic seabirds and preventative measures includes using well padded, soft enclosures and getting birds out into pools to swim as soon as they are able to. In the end around 8-10% of the rescued birds were successfully released and the experience and knowledge gained from this event was invaluable. Skills and techniques to deal with huge numbers of patients were developed which will be able to be applied to other similar disaster situations such as oil spills.